We are the first site in the UK to be using the new state of the art Battlefield Rifle Pro lasertag marker. These are far superior to other types of lasertag markers that are used by other lasertag sites. Accurate to an inch, you have to aim to hit your opponents and with a range of weapon settings to choose from, you can be sure of varied and exciting game play. This is not Quasar and should not be confused with being the same thing. To book your paintballing experience, simply call Julie on 07790 143118 or alternatively email julie@gunsmoke-paintball.co.uk or use our contact form at the bottom of this page. We have introduced Lasertag to Gunsmoke Paintball and Games as you expect are fast and furious and we are offering this on a group basis. £200 for a 1 hour session for 10 people (£20 per player – maximum 10 players). Minimum age is 8 years old and anyone under 18 years of age will need parental consent and an adult must be in attendance. Prebooking is essential. For all Laser Tag bookings payment is required in full at time of booking and is non-refundable or transferable. We will supply you with everything you need to play although you may wish to bring suitable outdoor footwear. Laser tag is a no impact sport so you can wear your usual clothes if you prefer. We can supply overalls if required. Please note that additional hours can be obtained subject to the bookings for that day. Please note that times for game play can be flexible by prior arrangement. 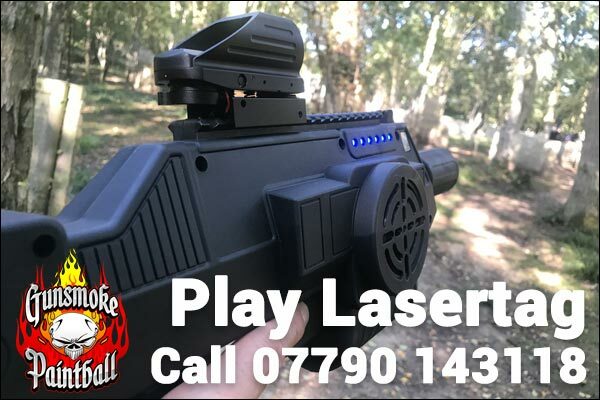 To book your paintball session, you can complete the contact form or alternatively call Julie on 07790 143118 or alternatively email Julie@gunsmoke-paintball.co.uk stating Tactical Lasertag booking.